At our house, we like to have a recipe for EVERY holiday. This is another (modified) family recipe, handed down for at least 4 generations. It started as a recipe for pineapple upside down cake, morphed into a strawberry cake, then became vegan for my eggless relative–then suddenly it was gluten-free, too. But, it doesn’t matter what it used to be…because, it makes the lightest, fluffiest cupcakes you’ve ever eaten. 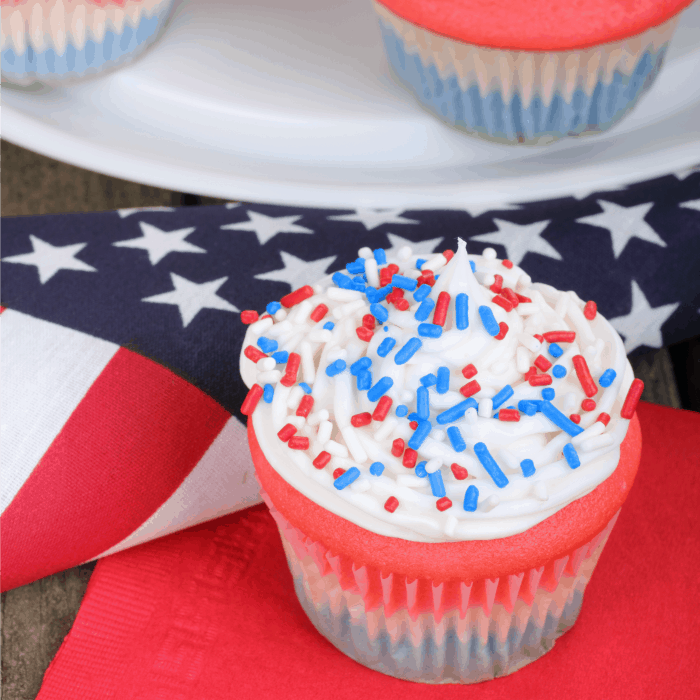 But, be warned, once you’ve had one of these Gluten-Free & Vegan Red-White-and-Blue Cupcakes, you can’t stop. I mean, really, you’ll be licking the crumbs off the plate. 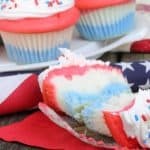 If you’re not into the whole making of the Gluten-Free & Vegan Red-White-and-Blue Cupcakes from scratch, you can do a little back-door action with this awesome gluten-free & vegan cake mix. I ordered my own set and was quite impressed with the results (although I just made plain vanilla ones…long story, but needless to say, my husband is kind of cupcaked-out for the time being). 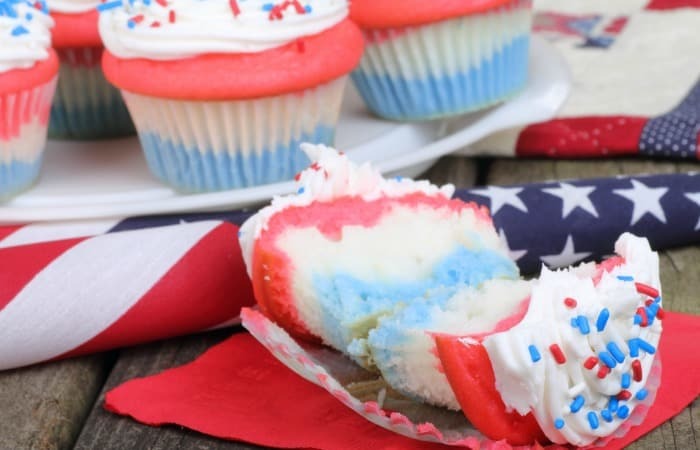 Be warned, once you've had one of these Gluten-Free & Vegan Red-White-and-Blue Cupcakes, you can't stop. I mean, really, you'll be licking the crumbs off the plate. Add 1/3 of dry ingredient mixture to butter and sugar mixture, mix. Combine Coconut Milk, Vinegar and Vanilla, and add 1/3 of milk and vanilla mixture to other mixture, mix well. Alternately add 1/3 of dry ingredients and 1/3 of milk and vanilla, mixing well between additions. Divide batter into 3 equal parts. Add red food coloring to one portion of batter, and blue food coloring to another. Spoon about a tablespoon of each color batter into paper baking cups (white so you can see through them kinda) beginning with blue batter, then white (or uncolored), then red--cups should be about 1/2 to 2/3 full. Spoon into piping bag and top cupcakes (or just slap it on there with a knife if you're not feeling the piping bag like me). Adorn with red and blue sprinkles. 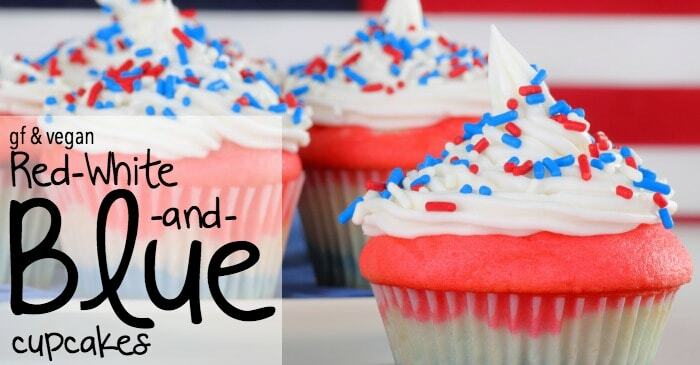 So, what do you think of my Gluten-Free & Vegan Red-White-and-Blue Cupcakes? If you try them, drop me a line in the comments below to let me know how they turn out for you!